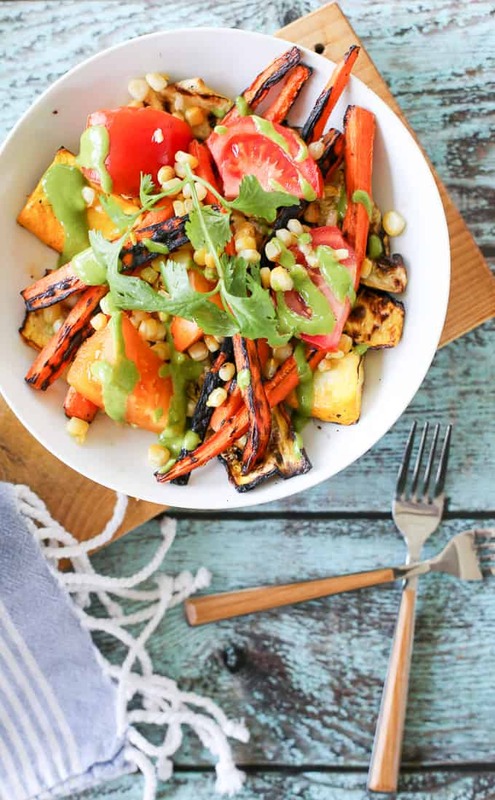 I love grilled food whether it’s veggies, meat or even fruit. I think the grill imparts such a great flavor on the food that really can’t be replicated in the kitchen. Sometimes we get on a grilling roll and we grill the entire meal. 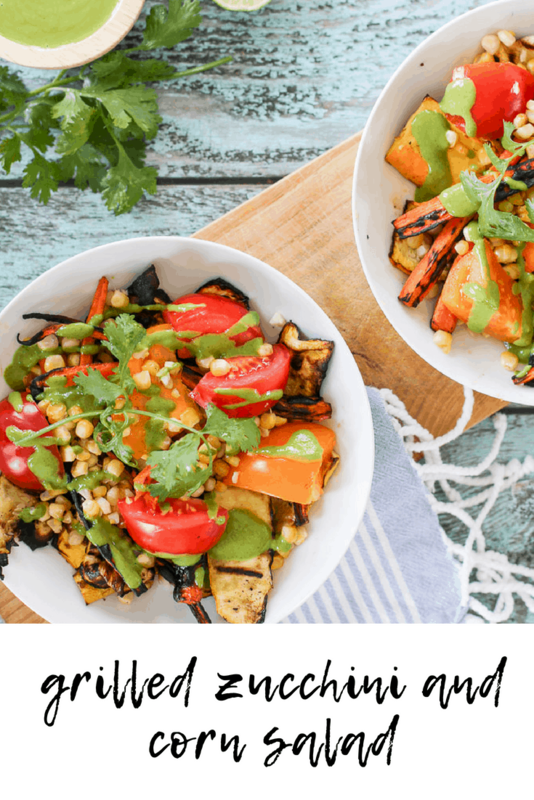 Most recently we decided to grill various veggies and turn it into a salad. 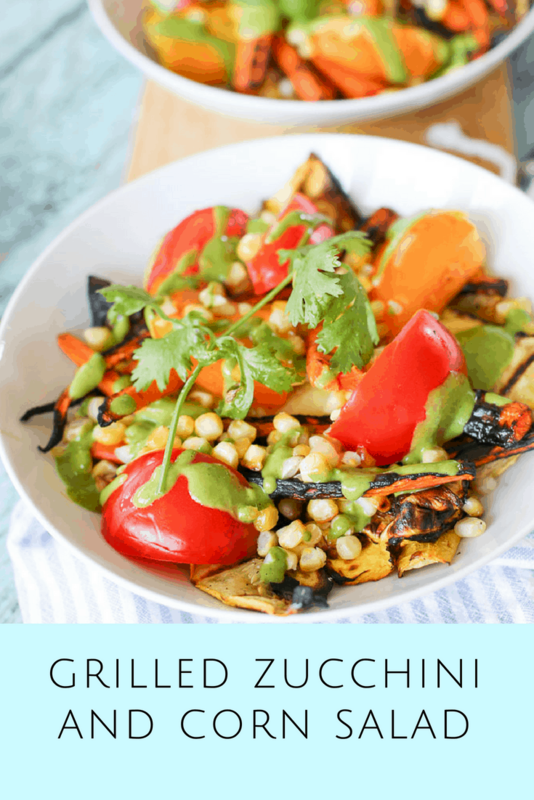 This grilled zucchini and corn salad is a great way to get your veggies and greens in with the maximum amount of flavor. 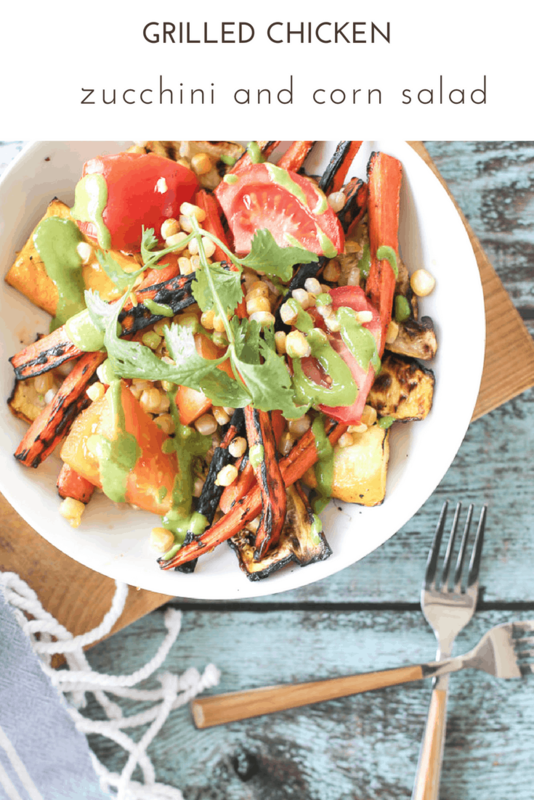 The salad contains grilled zucchini, carrots and corn, tomatoes and chicken. Since all three vegetables and the chicken are grilled, putting this together is easy. I made a tasty cilantro dressing to go along with it. 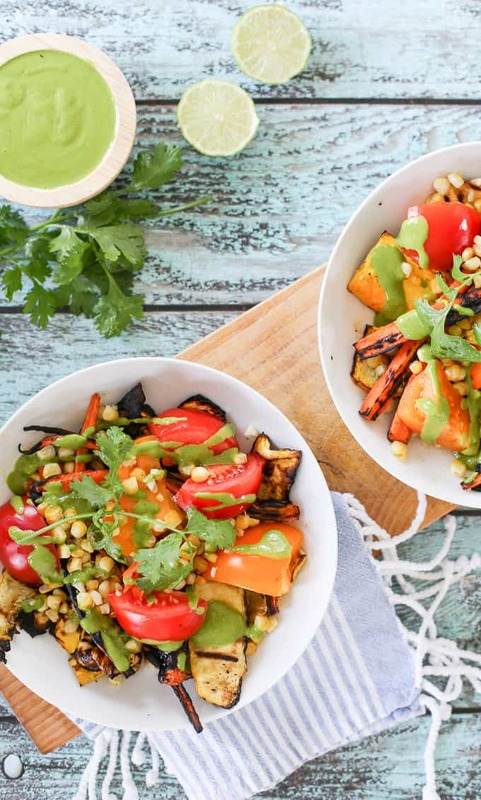 It’s got tahini and lime in it as well so the flavors blend into a unique and light dressing. This is also a great way to use up any cilantro you may have. A tip about cilantro…if you have a cilantro plant, make sure to keep it trimmed. We left for vacation and had no one to trim it and then it bloomed into a giant mistake. I’ve tried to reverse the effects and trim it down but I think it’s done for. Hopefully that will help you guys prevent that issue! Lightly coat all vegetables and chicken with olive oil and salt and pepper and grill (minus tomatoes). Place zucchini, carrots and chicken in a bowl. 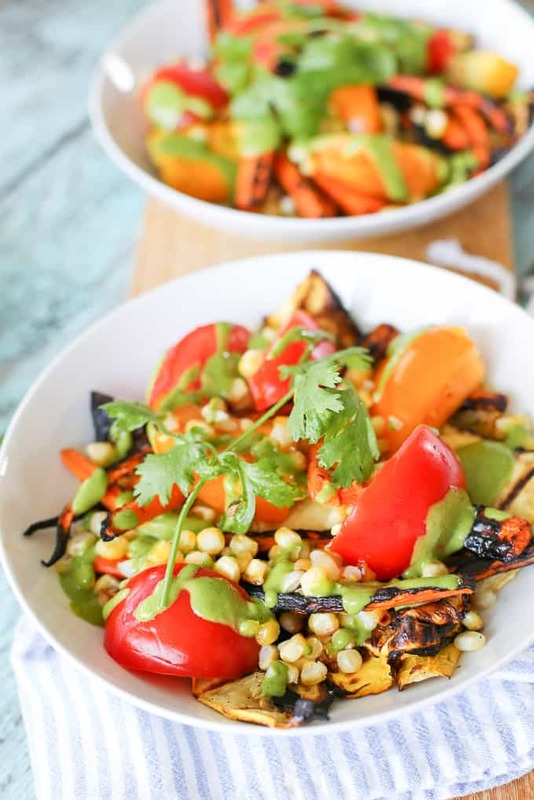 Cut kernels off of the cob and add to veggie bowl. Top with tomatoes. 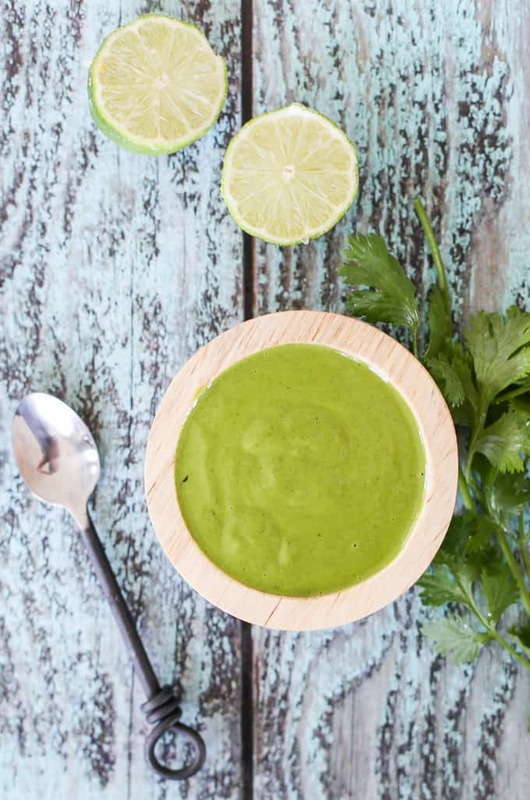 In a blender, puree cilantro, olive oil, lime juice, tahini, vinegar and salt. Serve with salad.